One Pudding Pastry free on a minimum order of Rs 300! FLAT 15% OFF on all repeat Online Orders! 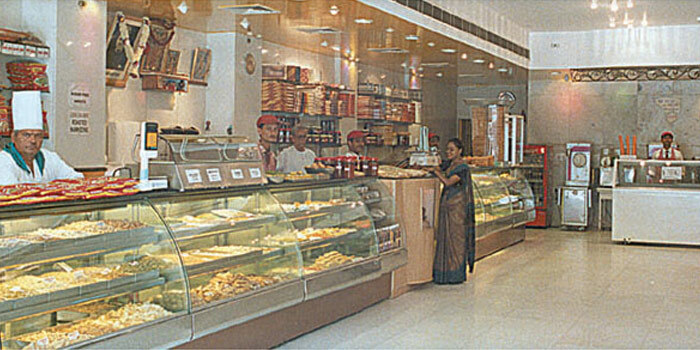 Laxmi Misthan Bhandar, or LMB as it is popularly known as a landmark modern sweet shop, restaurant and hotel in Johari Bazar, Jaipur, the Pink city. Backed by a glorious saga of 290 legendary years of being traditional sweets craftsmen, LMB is inspired by the Indian ideal of food, that is, purity of mind follows from purity of diet. The founder of LMB nursed a vision of setting a trend in food culture by offering food and hospitality to its patrons, aligned with the highest Indian traditions of food enshrined in the ancient texts. Its sweets are famous for their sheer taste and quality. Even an Arab sheikh sitting thousands of miles away swears by this shop after treating his taste buds with the unbelievable taste of Special Paneer Ghewar, an attestation to reliability, and strength of quality. LMB’s sweet are Jaipur’s pride and are famous all over the world. Its patrons are spread throughout the globe. LMB has created a unique brand and has established itself in Sweets, Namkeens, (savory snacks), Chat (a snack food) & traditional rajasthani delicacies. It serves over 200 kinds of Sweets, Namkeens on any day in addition to a range of Pickles, Eagles Bakery Items, and Syrups, to name a few. The specialty sweets and preparations include Special Paneer Ghewar, Doodh Phini, Mishri Mawa, Sohan Halwa, Rasmalai, Aloo Tikki, Dahi Vada and Royal Rajasthani Thal. Delivering sweets and food all across Jaipur, PAN-India & worldwide. By far they serve the best Rasmalai ever . Kesari ras malai with delicious syrup just melts in your mouth . LMB of Jaipur is famous for other specialities too like dal bati churma,katchori ,tikki and various chaat . The tikki was average but the malai lassi was good . Also serve lunch n dinner . Not just a sweet shop, this is a famous landmark of Johri Bazaar and Jaipur where one can go for an authentic Jaipur taste. I visited with my wife for a round of chat and sweets after a hectic pre-Diwali day. Between the two of us, we had aloo tikiya, dal kachori and pyaaz kachori. In sweets we had kulhad milk and kesar sandesh. Everything was excellent and service was brisk even at 11pm in the night. I would especially recommend the pyaaz kachori. The quality of Kesar Sandesh would surprise any connoisseur of this delicacy from Bengal. This place is very well reputed in Jaipur and when you visit there, you'll know why. It has a lot to offer: from sweets and snacks to all kinds of Rajasthani bites. I tried out the Pyaaz Kachori here. The filling of the Kachori was just amazing. We had a few sweets including Rasmalai there, none of which disappointed us. The paneer ghewar here is a must try. You can also go upto the restaurant to have various cuisines. Another place with history just like the city. The food here has never lost the taste and the charm. People from all over the city and tourists come to eat at this place. They have varieties of chats, sweets and savories. Since it is located on the shopping street of Johri bazaar, it's easy to eat and shop. So if you are in the city and looking for clean and hygienic,yet delicious food. Go nowhere but this place, it'll be a bit heavy on the pocket but all the things are a must try. Weather it is their street food ( junk food) or their proper north Indian cuisine. Try their jumbo thalis as well. And sweets are worth drooling- mind it, their is space/ parking crunch and all the food is prepared in pure desi ghee! This place has a LOT of things to offer in terms of snacks, sweets, authentic Rajasthani things. We purchased a lot of things from here on our way back to Bangalore. The Paneer Ghevar is a must try.